In the Courtship of Princess Leia, two matriarchal societies play significant roles. Since then, both cultures have continued to make an impact on Star Wars storytelling: the Hapans in the New Jedi Order, Dark Nest, and Legacy of the Force series and Dathomir’s Nightsisters in a key storyline in The Clone Wars television series. During the first part of our Hapan discussion, Racheal, Kay, and I covered the broader elements of their society and relationship with the Jedi; for the second part, we wanted to focus on the character Tenel Ka and her daughter Allana. Tenel Ka is the daughter of Hapan noble Prince Isolder and the Dathomirian Force-sensitive warrior Teneniel Djo. Like many princess characters in storytelling, Isolder overcomes pressure exerted by his mother the Queen to marry for the good of his people and not for love. To be with the man she loves, Teneniel Djo leaves behind her primitive homeworld to live in the vicious Hapan court. 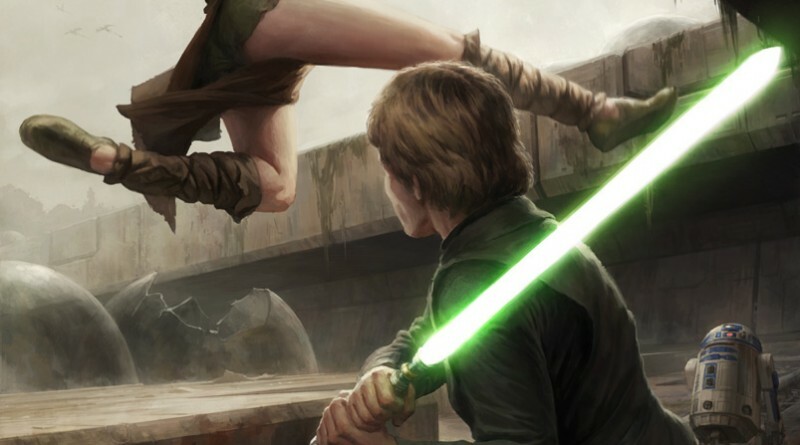 Teneniel Djo battling Luke Skywalker has been visualized by artist Darren Tan for the upcoming Essential Reader’s Companion. He certainly captures the fierce character Teneniel Djo was. 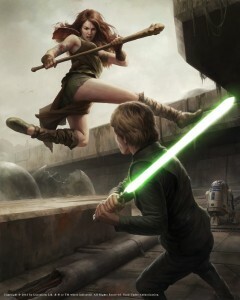 In the Young Jedi Knights series, Tenel Ka is trained in the ways of the Jedi. Many female readers in particular found the young Jedi princess’ struggle with the numerous conflicting demands to be compelling and relatable. Her character has served an important role throughout the post-Return of the Jedi stories, and when Racheal, Kay, and I embarked on this discussion, one of our goals was to explain the positives and negatives in her portrayal. We all agreed she is a fantastic character with unlimited potential, and that she needs her future stories managed with a keen eye to where she has been, who she is, and what she can do to benefit the female audience as a positive role model. After analyzing the role Tenel Ka has been given in previous stories, the discussion naturally turned to her daughter Allana’s present and future. Still clad in a lightweight leather garment fashioned from Dathomir lizard skins, Tenel Ka made her way to her mother’s room, as she did each morning. Teneniel Djo often seemed cheered by this reminder of her homeworld. We mentioned Tenel Ka briefly earlier. 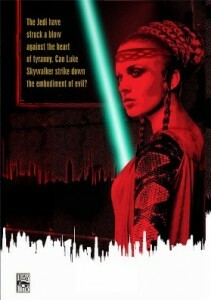 She literally is a Jedi Princess – an archetype that will be covered at my GeekGirlCon panel this summer. Yet she defies the stereotype of a princess in fairy tales or literature. What are your thoughts on how her character breaks the mold? Racheal: The first book I read with Tenel Ka in it was The Lost Ones. She struck me as someone who had something to prove to herself. She wanted to be a particular type of person, a warrior who didn’t need anything or anyone. At that point, I didn’t know she was a princess. Upon learning her role, my views on her stayed the same. The princess who doesn’t want to be one isn’t a new idea, but for once, this princess didn’t drop her character to fall in love with Prince Charming. Tenel Ka instead embraces both sides of her life without losing who she is. Kay: I think Tenel Ka preferred the Jedi part over the princess part. In fact, I’d go so far as to say that her biggest break away from a fairy tale princess is that she doesn’t really want to be a princess. We never see her excited about fancy dresses or attending parties, and she certainly wasn’t looking for anyone to rescue her at any time. It’s more than her wanting to know what the world is like outside of castle walls. She didn’t look forward to ruling – not because she wanted to extend her carefree-princess time, but because she didn’t really want the weight of all the politics, duty, and other complications. When it comes down to it, though, she eventually accepts her position with grace. She’s certainly regal in pretty much everything she does. Tricia: That is one of the reasons Tenel Ka has been a compelling character. She didn’t want to be a princess because she wanted to be a Jedi. It’s her sense of duty and her understanding of the broader implications to Hapes and the galaxy as a whole – things she knew because she had trained as a Jedi – that compelled her to accept the role of Queen in Dark Journey. After losing her arm in a sparring accident with Jacen Solo, Tenel Ka became one of the few examples of a superhero with a disability. While readers know this presents a challenge, Tenel Ka’s character never seems challenged by it. How has this made an impression on you? Would you like to see more characters overcoming disabilities to participate as heroes in the Star Wars universe? Racheal: Two occurrences of Tenel Ka overcoming her disability stay fresh in my mind: climbing the Jedi Temple wall and braiding her hair. Climbing the temple with only one full arm is a clear, definite example that’s similar to someone with prosthetic running a relay. It’s adjusting to everyday life that created a more striking dynamic. We take for granted that we can braid hair, tie shoes, put on a robe, and so much more, but without a full arm, Tenel Ka manages to take care of herself. Her disability isn’t constantly used as a way to classify her. It’s become a part of who she is. While we have seen characters with prosthetics, scars, and hoverchairs, it’s important to show how these characters overcame their handicap. 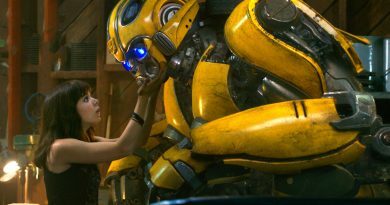 Several authors write remarks about the maintenance Luke must do to his mechanical hand, which reminds readers that although Luke has a disability, it hasn’t stopped him. He deals with it as he must. We need to see more characters that overcome disabilities. Kay: Frankly, I often forget Tenel Ka is missing an arm. I think we don’t get a lot of opportunity to see characters overcoming disabilities because so many (especially the Jedi) go into a healing trance. Then there’s all the technology of the Star Wars universe – the bacta, the mechanical body parts, and the robots performing procedures. So the fact that even though there is that technology, Tenel Ka said “no thanks” to it is a testament to her. The fact that it fades into the background for me as a reader means she doesn’t let the lost arm define her. I wouldn’t mind seeing new characters overcoming disabilities – or seeing more of characters who already have, let’s say, a missing eye and a limp (for instance, Soontir Fel). Tricia: Almost everyone has something to overcome in life. Tenel Ka is still shown training, sparring, and developing ways to succeed despite her limitations, which makes her a great role model. I hope too that we see more of Tenel Ka specifically, with moments of characterization that acknowledge her inimitable spirit, and also new characters who overcome adversity. Prince Isolder led his daughter through the elaborate steps. Tenel Ka danced as she fought- with singular grace and fierce absolute concentration. “I wonder what might happen to a man who stepped on her toes,” Jag mused. Jaina shot a startled look at him and noted the faint, wry lift to the one corner of his lips. “Their heads are mounted on the trophy room wall,” she said with mock seriousness. Tenel Ka’s storyline hasn’t always appealed to her fans. As the events of the Dark Nest trilogy unfolded, her motivations concerning her sexual relationship with Jacen were inscrutable. He ends up with military support; she ends up pregnant. Did this weaken or strengthen her characterization in your opinion? Racheal: It fits the Hapan culture, but it’s something Ta’a Chume would do. Good versus evil is such an important part of Star Wars that when a hero does something that toes the line, it seems more sinister. Tenel Ka bucked the idea of being her grandmother. She isn’t the same ruler Hapes is used to seeing. By trading ships for a child, she falls from what she was into someone else. While it’s understandable that Tenel Ka would rather have an heir by a person she trusts, there was a better way for it to unfold. She and Jacen could pursue a relationship first rather than make some type of deal. It’s too cold and callous for a pair of Jedi. Kay: I was not a fan of this plotline. I like my fair share of romance in Star Wars, and this event took something that a lot of people would like to think would include love and some level of commitment and made it into a cold exchange of goods. In a way, her character was strengthened in that she felt she needed to have an heir and she wanted it to be with someone she cared about, so she took control of the situation. Unfortunately, the aftertaste of two people using each other like that made me not think so highly of her or Jacen. Tricia: I understand the rationalization of this development as a storytelling point, but that doesn’t mean it sits well with me. The saga of Jacen Solo twisted several popular female characters in ways that made them unrecognizable to long time readers. 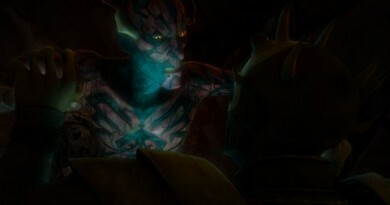 (Of course, that happened to Jacen as well, but too much drastic change within a brand can be problematic.) Jacen’s overarching story frustrated fans of many female characters in the ways it reflected on Tenel Ka, Tahiri, and even his sister Jaina. I believe there were options available for Allana’s conception that didn’t portray Tenel Ka in a manner that was disconnected from the way she had been characterized previously and yet still depicted Jacen’s descent toward the dark side. With that said, when faced with the truth about his fall, Tenel Ka acted decisively against Darth Caedus despite what that meant for her daughter or her own feelings. That’s the Tenel Ka I’d like to see more of. Their daughter, Allana, was born following that tryst, and by the end of the Legacy of the Force series Tenel Ka was Allana’s only living parent. While most of the galaxy believed Allana was dead, she had been placed secretly as the adopted daughter of Han and Leia Solo. Personally, I believe a storyline within Fate of the Jedi that showed Tenel Ka struggling to do her job while raising a child would have been more relatable to the female readers. What are your thoughts on this, and what would you like to see for mother and daughter in the future? Racheal: Keeping Allana and Tenel Ka together would have appealed to more female readers. With the Solos, Allana doesn’t act like a kid. She acts like an adult with childlike tendencies. Nine-year-olds don’t calmly shoot enemies. The storyline was a little thin. Allana resembled Jacen, based on descriptions. There’s no way that the many, many people the Solos encountered wouldn’t notice the resemblance not only to Jacen, but to Han and Leia. Some would keep it quiet, but it’s a large galaxy, the Solos are everywhere and most know what Jacen looked like. One of the best scenes with Tenel Ka was during Legacy of the Force when she speaks to Luke about Allana’s kidnapping by Jacen. Her struggle between mother and queen is so clear and compelling. If we were going to see Allana, I’d rather her be with Tenel Ka than Han and Leia on a regular basis. As a side note, her last name shouldn’t be Solo given her heritage. By using Solo, it separates her even more from Tenel Ka and their shared culture. Kay: It probably would have been more relatable, but Tenel Ka just wasn’t in Fate of the Jedi enough as it was for that concept to have much weight. I think we got a really nice taste of Tenel Ka’s conflict in regards to Allana in Apocalypse, and that redeemed her for me because it showed she most definitely cares about Allana as her daughter and a person and not just as a puzzle piece or heir. I’d like to see more mother/daughter time with Tenel Ka teaching important life lessons to Allana, but I think Allana also needs to spend some time at the Academy training as a Jedi. Tricia: It’s my impression they thought developing Allana as a character was important but wanted to avoid too much involvement with the Hapans. The decision to shove Allana into place as the adopted orphan daughter of Han and Leia didn’t work for many fans; it didn’t benefit the characterization of Han, Leia, Tenel Ka, or Allana in the end. As someone who has been immersed in the Star Wars EU for a long while, it’s my opinion that Ben and Allana needed something similar to the Young Jedi Knights series that allowed them to mature as children and also build a solid generation of friends around them to use in future books. In the Fate of the Jedi series, Allana’s destiny was foreshadowed in visions. Early in their lives, her father Jacen had been plagued by visions of the future and her aunt Jaina was bestowed a destiny as Sword of the Jedi. 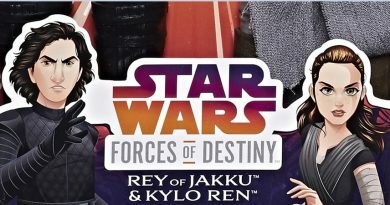 While the Star Wars movies explore the paths of heroes and the theme of destiny versus choice, it seems both Jaina’s and Jacen’s arcs mirrored their grandfather’s arc from the Prequel Trilogy rather than their uncle Luke’s in the Original Trilogy. Some indications point to Allana’s character being thrust down this same tragic path. What would you like to see in Allana’s arc in the upcoming books? Racheal: I don’t know about you two, but I’m tired of the whole prophecy/destiny mess. All those words and visions do is ruin lives. It goes against Yoda’s warnings to Luke about the future always changing. Luke should have learned his lesson and bestowed some more wisdom on that particular topic to his trainees. Prophecies and visions don’t mean a thing until a person puts meaning behind them. For example, in Harry Potter and the Order of the Phoenix we find out that a prophecy was made about Voldemort that referenced a potential enemy. A child born in July to people who had gone up against Voldemort three times would destroy him. Voldemort would mark his enemy and they can’t live in the same world. It’s explained that there were two known possibility couples: the Potters and the Longbottoms. Voldemort goes after the Potters, kills Harry’s parents, casts the killing curse on a baby, the curse rebounds and Voldemort dies. Harry is now marked with the lightning bolt scar and gained magical powers he wouldn’t have had without Voldemort. Had Voldemort not taken the prophecy for fact, he wouldn’t have made a powerful enemy specifically to kill him. Anakin Skywalker became his own enemy. Jacen took a vision so literally that it destroyed him. The fact that the future changes didn’t matter to him. The Sword of the Jedi prophecy has yet to be dealt with much and at this point, it’s more of an excuse to bring Jaina out to fix everyone’s problems. If Allana becomes queen and brings peace to the galaxy, great. What I don’t want to see is her falling to the same problem that a chunk of her family fell to. I would, however, prefer if she grew up a little bit before any of this takes place. She’s young. We have a second generation that needs some time to shine before her age group should come into play. If Allana takes the vision literally, no telling what she will do because of it. She might not go after a certain goal or stifle herself from what she is capable of doing because it could affect the vision. It will only make her story arc worse if she focuses on it. It could also make her feels as if her path is already set, so why should she work for a future. Kay: It would be nice to see Allana have some friends her own age as she goes on adventures, trains, learns more about the galaxy, and develops the foundations of the person she ultimately will be. Jaina has had a couple friends around her a majority of the time while Jacen separated from his friends and went the loner route. When you have a destiny or vision hanging over you, it seems that having friends can ground you when it all gets overwhelming. Also if we could not have her slinging around huge weaponry for a couple years, that’d be great. Tricia: I agree with Kay wholeheartedly about the ban on huge weaponry for Allana. Maybe she can try training lightsabers for a while. Most readers have children or know children, and they recognize that children comprehend morality and right and wrong on a simpler level. While Star Wars is space opera and these are superheroes, there are limits to what an adult is willing to accept. Personally, I struggled reading about a child playing an adult role in these grimmer, darker books. I am fine with being made to feel uncomfortable by the things that happen to a character, but when children are used I think it’s fair to ask if there is another way to make the storytelling point. That’s one of the reasons I’d like to see some Young Adult books for this character – most importantly so a new generation of fans, particularly fangirls, can be brought into the Expanded Universe. Right now, with Allana being a melting pot of Hapan, Dathomirian, Skywalker, Solo, and Jedi heritage she has the potential for some amazing tales that don’t need to be full blown epic odysseys. Show her as a precocious Solo in the Hapan court, or send her to Dathomir and tie into something from The Clone Wars show. Up next, we discuss the newest Hapan badass Taryn Fel, the secret society of the Lorellian Court, and how one scene with Taryn and Zekk in Apocalypse reveals the potential a book like Blood Oath has to shed light on the ways men and women can overcome sexism and sexist mindsets. 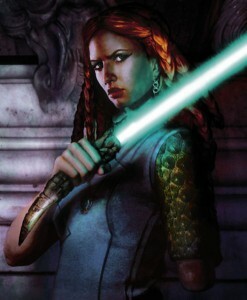 Image of Teneniel Djo courtesy of Del Rey, from the upcoming Star Wars: The Essential Reader’s Companion by Pablo Hidalgo (October 2, 2012). Artwork by Darren Tan. To Racheal, many thanks. Your voice will be missed but not forgotten. Re: Racheal – Totally agreed. Missed but not forgotten.